With closing of Berlin airport Tempelhof ended the period in airline industry of the Germany. It was a period of the Second World War, the era of the Cold War and the “rebirth” of the German capital at the beginning of the nineties in the late 20th century. Tempelhof was officially opened in October 1923, and the existing airport complex got its shape under the Nazi rule. Adolf Hitler decided to make the site “air stadium” with the use of large stone blocks and pillars. He was helped by Nazi architect Albert Speer, who constructed new terminal envisioned as a sign of a new and more beautiful Berlin, which was supposed to represent the “capital” of the world. The complex consists of 49 buildings, seven hangars and about 9,000 offices. 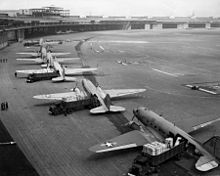 And the truth is that before the Second World War Tempelhof was one of the busiest airports in the world. According to the available information, there were about 50 international and 40 domestic arrivals per day.